Devonport Royal Dockyard Limited (DRDL) has submitted an application for a minor variation to an environmental permit which covers operations on their dockyard site in Plymouth, Devon. 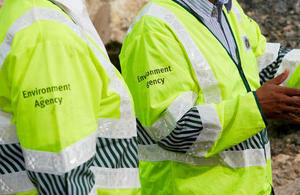 The Environment Agency will consult technical experts and the public on the environmental permit application received. The application, if approved, will enable them to increase discharges of carbon-14 to the atmosphere during the refit of the Royal Navy submarine, HMS Vanguard. Devonport Royal Dockyard Limited have an existing permit which allows them to dispose of radioactive wastes and they are now applying to vary this permit because there are aspects of the refit which may cause them to discharge more carbon-14 than the amount for which they are currently permitted. They want to increase the limit in their permit to discharge carbon from 43 to 66 Giga Becquerel. One becquerel is defined as the activity of a quantity of radioactive material in which 1 nucleus decays per second. The environmental permitting process is designed to ensure sites are operated without causing significant harm to the environment and human health. The Environment Agency will consult the Food Standards Agency and relevant technical experts on the technical detail of the permit variation and invite comments from the public before a decision is made on whether or not to vary the permit. Comments should be sent to the Environment Agency by Friday 17 June 2016: email DevonCornwallEnquiries@environment-agency.gov.uk. You can view a copy of the application for a variation and supporting documents.